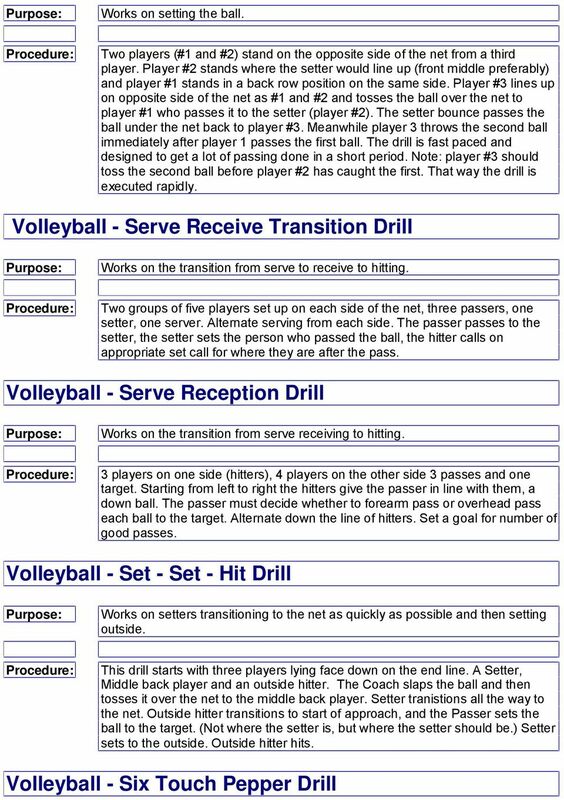 Download "Youth Volleyball Coaches Drill Book"
4 Works on practicing ball control with a wide variety of types of contacts. Put players in pairs. Player one hits the ball down to player two. Player two digs the ball to themselves, tomahawk's to themselves (overhead contact), then left fist only, right fist only, sets to themselves, then player two hits the ball down to player one, who repeats. 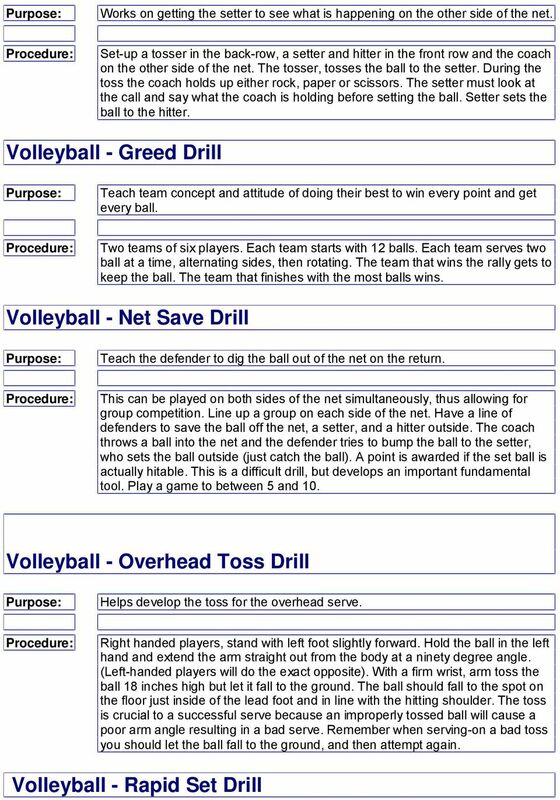 Volleyball - Target Practice Drill Practice controlling the serve. On the other side of the net set up 6 main targets at the front right and middle positions, as well as the back left and middle positions. Coach chooses target to aim for and server tries to hit the target on the serve. The team can be divided in half and this can be turned into a competition with points awarded to how many serves strike the chosen target area. Make sure to keep wrist firm throughout the serve. Contact with heel of hand through the middle back of the ball. The contact should sound like a "thud" not a "slap" sound. Hand follows ball to the target. Finish with hand along side or within bodyline. 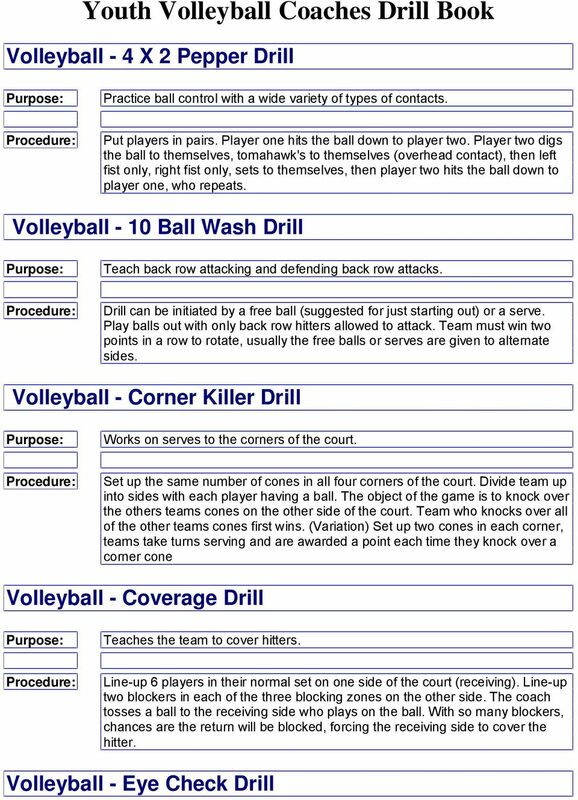 Volleyball - Two VS Two Drill Teaches teamwork. Both players must work together to stay on the court. The court is divided up in half and the back line for this game is the 10 foot line. The game is played within the 10 foot line on one half of the court. The whole team partners off and 2 players are on one side and 2 players are on the other. 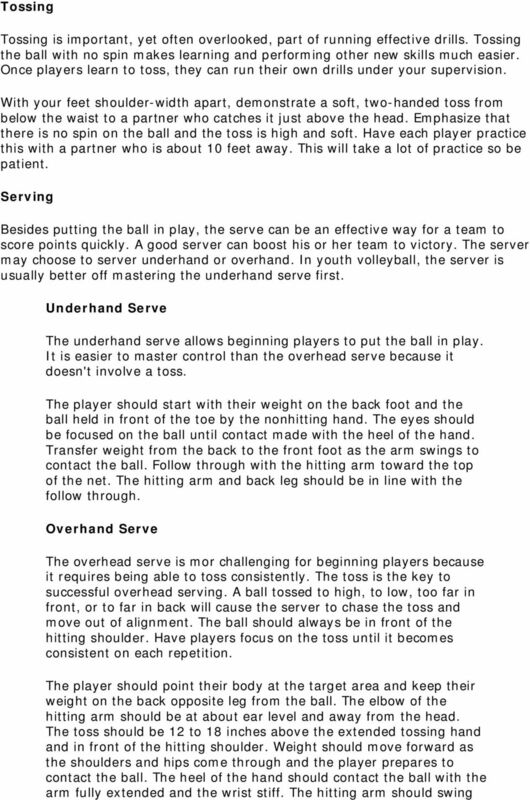 Using only underhand serves, one team serves to the other and play begins. Once a team wins a side out, the losers must leave the court and the new challengers come on to face the winning team. Challengers serve. This game is fast paced and a fun way to get everyone involved. 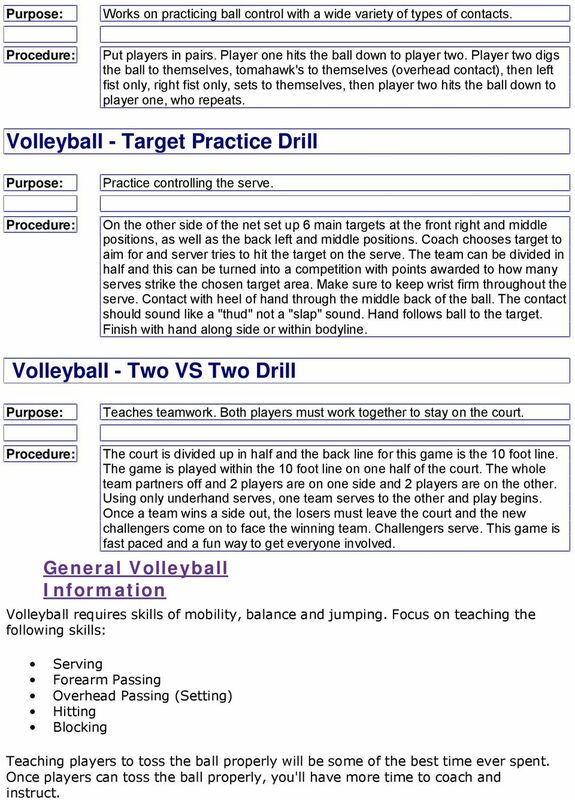 General Volleyball Information Volleyball requires skills of mobility, balance and jumping. Focus on teaching the following skills: Serving Forearm Passing Overhead Passing (Setting) Hitting Blocking Teaching players to toss the ball properly will be some of the best time ever spent. Once players can toss the ball properly, you'll have more time to coach and instruct. 7 arm as a whip and the hand as the tip of that whip. The snap of the whip begins in the shoulder. The elbow of the hitting hand should be drawn back, high and away from the shoulder. As contact is made, the hand should be firm and open, hitting the top half of the ball with the palm. Contact the ball at the one to two o'clock position. Follow through quickly. In the follow through the arm should remain on the same side of the body. The player can not touch the net with any part of the body. 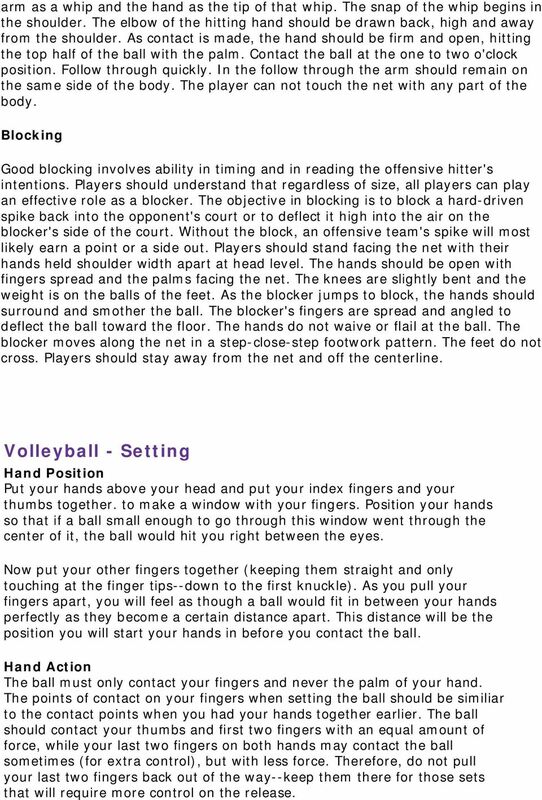 Blocking Good blocking involves ability in timing and in reading the offensive hitter's intentions. Players should understand that regardless of size, all players can play an effective role as a blocker. The objective in blocking is to block a hard-driven spike back into the opponent's court or to deflect it high into the air on the blocker's side of the court. Without the block, an offensive team's spike will most likely earn a point or a side out. Players should stand facing the net with their hands held shoulder width apart at head level. The hands should be open with fingers spread and the palms facing the net. The knees are slightly bent and the weight is on the balls of the feet. As the blocker jumps to block, the hands should surround and smother the ball. The blocker's fingers are spread and angled to deflect the ball toward the floor. 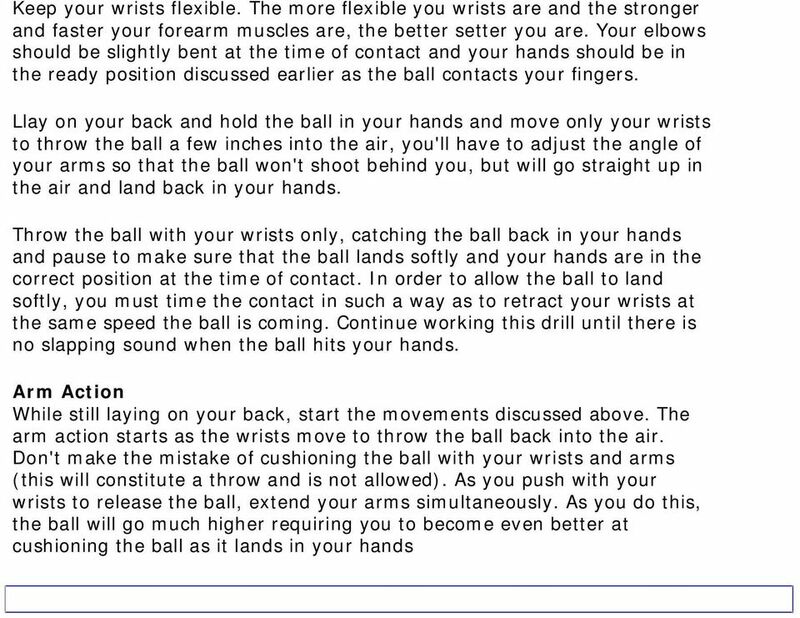 The hands do not waive or flail at the ball. The blocker moves along the net in a step-close-step footwork pattern. The feet do not cross. Players should stay away from the net and off the centerline. 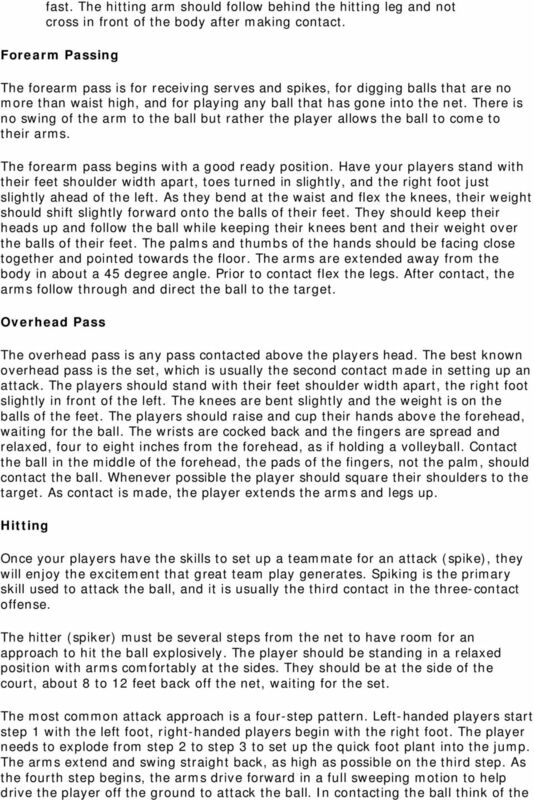 Volleyball - Setting Hand Position Put your hands above your head and put your index fingers and your thumbs together. to make a window with your fingers. Position your hands so that if a ball small enough to go through this window went through the center of it, the ball would hit you right between the eyes. Now put your other fingers together (keeping them straight and only touching at the finger tips--down to the first knuckle). As you pull your fingers apart, you will feel as though a ball would fit in between your hands perfectly as they become a certain distance apart. This distance will be the position you will start your hands in before you contact the ball. Hand Action The ball must only contact your fingers and never the palm of your hand. The points of contact on your fingers when setting the ball should be similiar to the contact points when you had your hands together earlier. The ball should contact your thumbs and first two fingers with an equal amount of force, while your last two fingers on both hands may contact the ball sometimes (for extra control), but with less force. Therefore, do not pull your last two fingers back out of the way--keep them there for those sets that will require more control on the release.